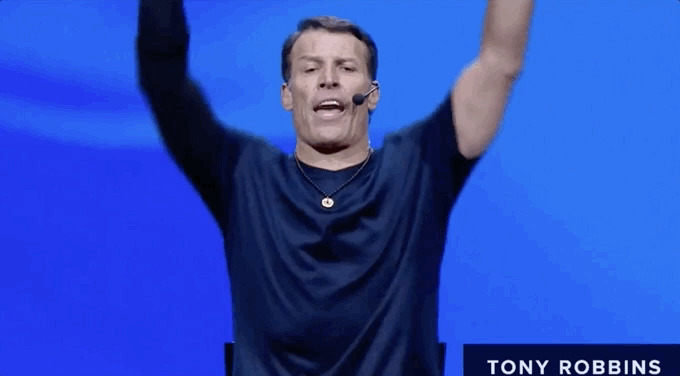 Courtesy of Tony Robbins‘If you don’t have 10 f—ing minutes for your life, you don’t have a life,’ said Tony Robbins, pictured. Robbins has spent the last three decades as the world’s foremost performance coach, taking on clients like billionaire investor Paul Tudor Jones, tennis champion Serena Williams, and former president Bill Clinton. He’s sold millions of books and audio lessons, and thousands of people attend his seminars every year. 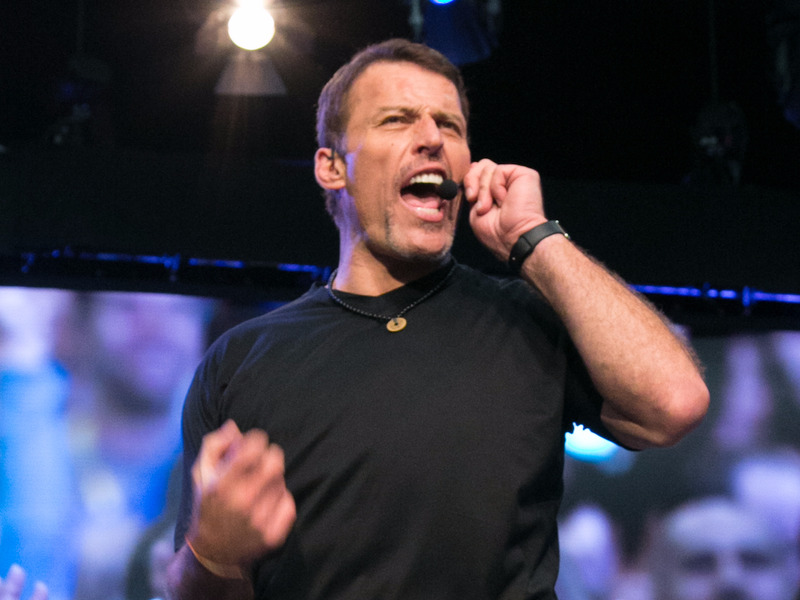 Robbins recently offered a peek into his “Unleash the Power Within” event, a three-and-a-half day intensive course designed to give participants an action plan for overhauling their lives. Tickets run from $US650 to around $US3,000, but Robbins streamed over an hour of his talk in front of a sold out crowd in New Jersey’s Prudential Center over Facebook Live. One of the lessons covered was the most important aspect of his morning routine, an exercise he calls “priming.” It’s rooted in yoga and mindfulness meditation. Priming, then, is intended to get you in an energised, positive state that will carry you through the day. “If you don’t have 10 f—ing minutes for your life, you don’t have a life,” he said. In a previous interview with Business Insider, Robbins said that he often plays meditative music while he primes, but you can also do it in silence. The breathing exercise should take around a minute, with each of the remaining three steps lasting around three minutes. You can spend longer on any step if you’d like. In Robbins’ version, begin by sitting straight with your eyes closed. Inhale deeply through your nostrils while simultaneously lifting your arms in a shoulder press motion, and then exhale forcefully through your nostrils while bringing your arms back to your body, palms up. Perform the breaths in quick succession. In Robbins’ version, he does three sets of 30 with brief breaks in between. This can further be broken down into three sets of 10 repeated three times. When starting to learn the exercise, you can begin with three sets of 10 and work your way up. The exercise should leave you feeling energised. Robbins then takes a few minutes to think of three things he’s grateful for, spending about a minute on each. Each of the things you’re grateful for should be experienced as a moment you’re reliving. So, if you are grateful for the way your friends surprised you on your birthday the day before, you should remember it as it happened. Imagine a light flowing into the top of your head and then spreading into the rest of your body, strengthening and healing you. When it has flowed through your entire body, then visualise that energy flowing out from your body to the world around you. You can focus on loved ones, as well as total strangers who may be in your vicinity. Robbins then spends the last three minutes visualising what it is like to achieve a goal.”Don’t think about making it happen, see it as done,” Robbins said. Spend a minute on each.